When I was a little girl I loved baking brownies with my dad for one simple reason. He always marbled in a couple spoons of peanut butter into the brownies before baking. I’m a huge fan of peanut butter and chocolate together. I’ve been eying these Super Duper Chocolate Peanut Butter Protein Truffles from my friend Sandi at Fearless Dining since she shared the recipe. There is something magical about the peanut butter, chocolate combo. 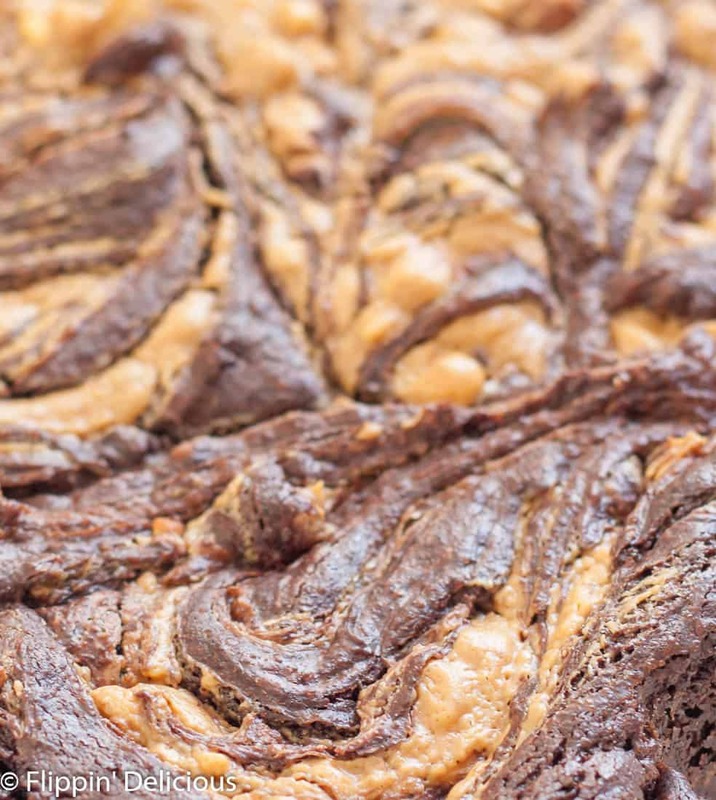 And….there is something magical about this peanut butter swirl! I was enchanted with it as a child. I couldn’t figure out how my dad created those curves and loops dancing over the top of the crackly brownie top like and ice skater twirling on a rink. 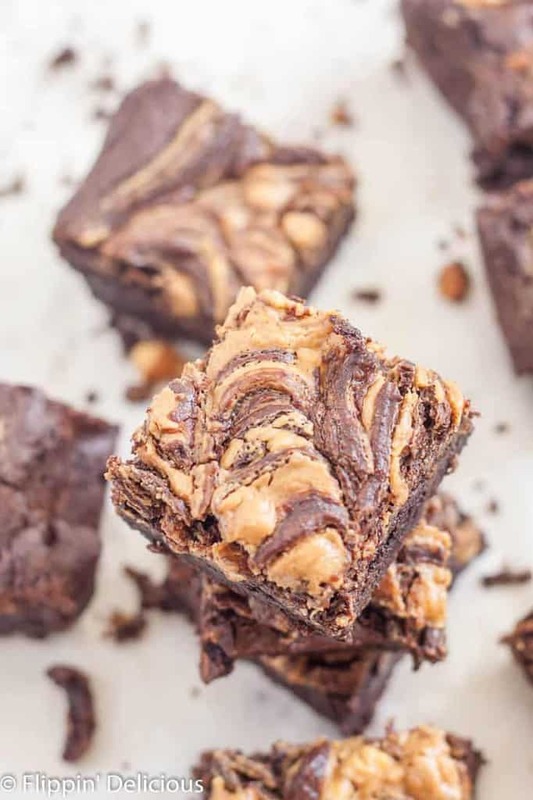 The way that the peanut butter not only swirled on the top of the brownie, but underneath the crust so that you got a little peanut butter in every bite. 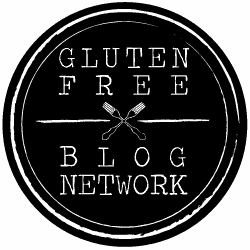 You can use your favorite gluten free or dairy free brownie recipe (I used my Best Fudgy Gluten Free Brownies this time, but I have also used my Dark Chocolate Chewy Gluten Free Brownies…it just depends on my mood.) 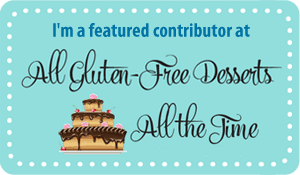 You can also use your favorite gluten free brownie mix! Once you have your brownie batter poured into your pan, just drop a few spoonfuls of peanut butter on top. I drop 5-8 spoons on top of my brownie batter to ensure that I have the maximum peanut butter swirl-age. 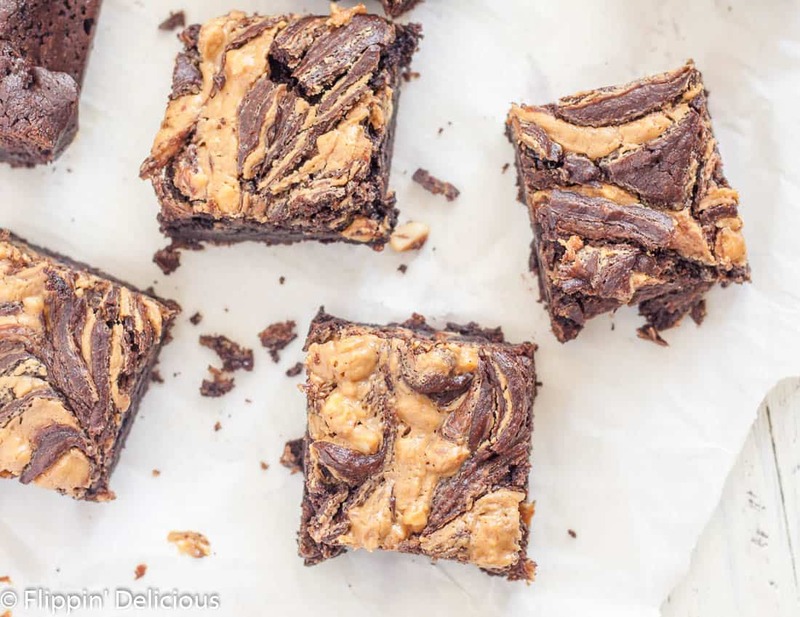 Then pull a butter knife through the peanut butter, marbling it into the brownies and swirling it over the top. In some ways I feel like this is a cheater recipe. It is so easy! Which is one of the reasons that I haven’t shared it before. But you know what? This is my favorite way to dress up a classic brownie and I decided that it was time I shared my “secret” with you! 1 recipe brownie batter( I use my fudgy gluten free brownies OR chewy gluten free brownies) OR you can use your favorite gluten-free brownie mix. Preheat your oven to the temperature specified by your brownie batter recipes. Line a pan (8x8 for most recipes or mixes) with parchment paper of easy brownie removal, or lightly grease it. Pour the brownie batter into the prepared pan and spread it evenly. Drop the peanut butter by spoonfuls on top of the brownie batter. Gently swirl the peanut butter into the brownie batter with a butter knife held perpendicular to the pan. Bake according to the brownie batter recipe. Oh my goodness!! This is delish looking!!! These look so flippin’ good, that swirl! Love brownies and peanut butter! Wish I had a couple to enjoy right now. I’m a huge fan of pb and chocolate! I’ve done this a time or two and it’s been a huge hit. Might have to try your brownie recipe, too! We all need quick and easy recipes sometimes. I love just being able to “dress them up” too. Thanks for sharing. These brownies grew on me! 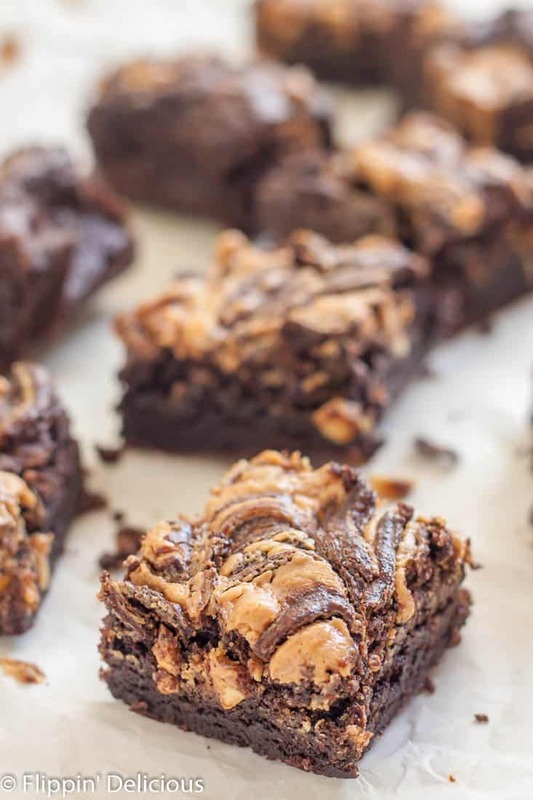 I love the idea of combining brownies and peanut butter! Delicious recipe, Brianna!